Not all LED lights are the same and it’s important for you to learn what makes them different before making any purchases for your home. We know that lighting can already be used to alter your mood, however recent studies show that it can have an impact on your overall health. Many people might underestimate its power, but research has suggested that overexposure to certain types of light can increase the risks of serious conditions such as type 2 diabetes and high blood pressure. On the other and more desirable hand, good quality lights can have you feeling better – both mentally and physically. So, in order to thrive in a happy and healthy home, you should choose your lighting wisely! Three main things determine the type of light produced by a lamp: the colour temperature, colour rendering and lumen output. Originally, LED lights would illuminate with a bright white light, whilst a yellow, warmer glow was reserved for traditional incandescent bulbs. 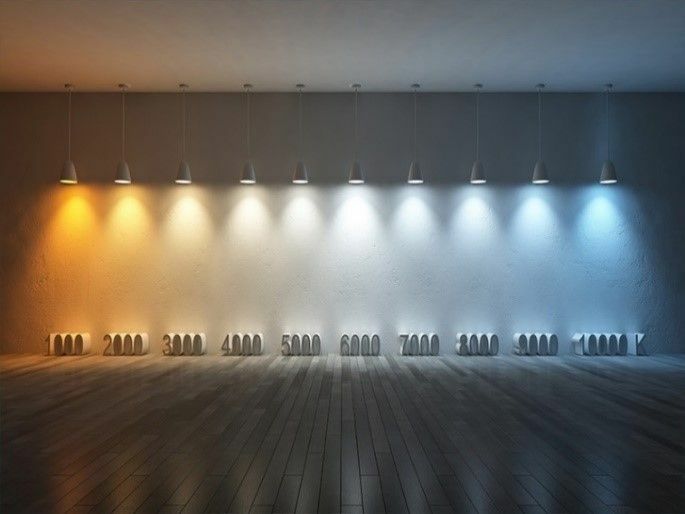 However, over the years, a lot of work has gone into the improvement of LEDs, and today you can choose from a vast range of colour temperatures. These temperatures are given a numerical value and measured in degrees Kelvin. In the image above, you can see that the warmer, yellow/orange lights are between 1000 and 3000K, whereas the cooler, white/blue lights are given a higher value of 8000 to 10000K. For reference, natural sunlight at midday is said to be around 6500K. It’s likely that the lamps in your home produce warm light, while office environments are typically lit by colder, whiter bulbs. The colour rendering index (CRI, or sometimes Ra) is used to measure a lamp’s ability to faithfully and accurately reveal the colours of an object compared to their existence in natural sunlight. Bulbs are given a value between 0-100 and the higher the number translates to a more desirable outcome, as daylight is considered to have a CRI of 100. Most LEDs bulbs score above 80, whereas traditional fluorescent lights range from about 50. The image above demonstrates what these figures mean for the human eye. In 2011, the EU ruled that workplace lighting must have a CRI of above 80, so as to ensure safer work environments. However, since the quality of colour rendering has vastly improved over time, it’s now quite uncommon to find lamps that have low CRIs, and most will score above 80. As a consequence, many have suggested to review using CRI as a measurement and replace it with a system that can more accurately judge the lamp’s quality. Bulbs with the highest CRIs can understandably cost more, but they may be well worth the money if you’re interested in making a superior investment. Lumens measure the brightness of the light omitted by a lamp. Predictably, the higher number of lumens results in a brighter light, whilst fewer lumens mean a dimmer light. Before low energy lighting had emerged, consumers would refer to the bulb’s wattage to get an idea of its brightness. Nowadays, of course, this isn’t particularly reliable, as a 10w LED may very well be able to produce the same amount of light as a 60w standard incandescent bulb. The right choice for your home lighting ultimately depends on what mood you’d prefer to set for each room. It’s generally expected that living room and lounge lighting will adhere to warmer temperatures for a more relaxing atmosphere, so around the 2500K mark. On the other hand, it’s usually thought that kitchen and bathroom lights work best in cooler temperatures (around 4000K), so that the space appears lighter and somehow cleaner. Alternatively, you could always buy in bulk and opt for the same colour temperature, CRI and lumen output for every room in your home. This can maximise your chances of achieving the same lifespan for each lamp and therefore reduce your maintenance costs. You can also adjust the temperature by purchasing dimmable lamps. For instance, a 2800K bulb could be dimmed until it reaches 1800K and appears like warm candlelight. The best thing to do is consider your room’s functions, how bright you’ll need the space to be, and go from there.